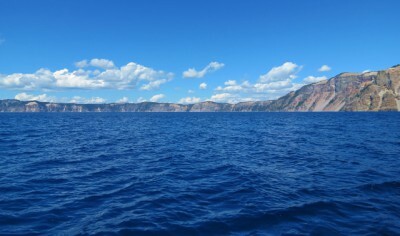 There are only five boats permitted on Crater Lake – three tour boats and two research vessels. And I got to spend two hours on one! The second full day of our Southern Oregon long weekend was dedicated to a trip to Crater Lake, and the boat tour! We left first thing in the morning (but not too early, because it was our vacation) for the two hour drive to the lake from our vacation home in Grants Pass, Oregon. We stopped to check out the upper Rogue River for a few minutes, walking along the river and snapping some photos. But we couldn’t stay long because we needed to make it up to the lake in time for our tour! We got to the Cleetwood Cove Trail parking area, and then had to find parking along the road because the parking lot was full! We checked in at the kiosk (you are required to check in and pick up your tickets before you hike down) and then started down the 1.1 mile trail to the lake. The trail isn’t too steep, because there are a lot of switchbacks, but there are sections that have lots of loose gravel. A couple of times my feet slipped on the loose gravel, even though I was wearing my Chaco sandals that have a good sole. But soon enough, we were down at the bottom, where we checked in again (checking in was quite a theme on this tour…). We had about 20 minutes to relax at the bottom, eat some snacks, and dip my feet in the water before the boat tour started. And boy was that water cold! We got all settled in on the boat and set off for our two hour tour (go to the bathroom before you get on the boat people – there’s no peeing in the lake!). Our ranger started us off by telling us about the history of Crater Lake, beginning with the Native American oral history that I told you about in my last post. Then he talked about William Gladstone Steel, and how his efforts are one of the main reasons Crater Lake is a National Park. After the history talk, the Ranger discussed the geology about how Crater Lake was formed, and the formations that exist on the edges of the caldera and within the lake itself. The Devil’s Backbone is a dike that was created by lava as it pushed up and filled cracks. The “backbone” emerged as the softer rock around it is eroded away. Devil’s Backbone ranges in width from 23 feet to about 50 feet and is the only backbone that goes all the way from the water’s edge to the top of the caldera. Devil’s Backbone – This shows how much it sticks up! Wizard Island is a cinder cone that began to form while the caldera was filling with water. 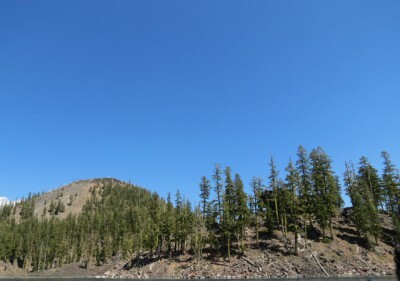 The top 763 feet of the 2500 foot cinder cone are visible above the surface of the lake. Aerial photos show where volcanic activity is apparent at the top of the cone. Depending on which tour you choose, you can get dropped off on Wizard Island and spend some time hiking there. 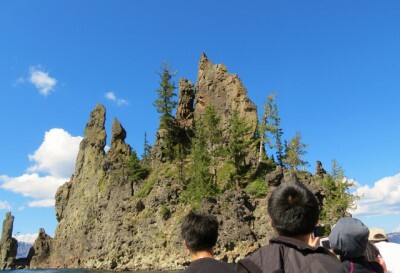 Wizard Island – the cinder cone shows well on the left, but you can’t see the crater at the top from the boat. The Phantom Ship is an island created by the remains of lava flow. It is about 500 feet long with a maximum width of 200 feet; the dramatic spires that give The Phantom Ship its name tower about 170 feet above the surface of the lake. Despite not having much soil, trees make their home there, along with other shrubs. 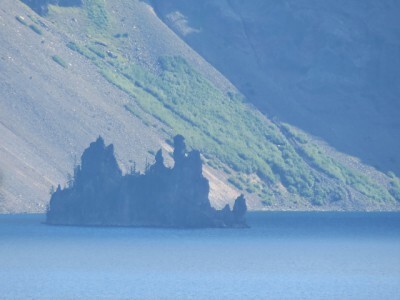 The Phantom Ship is probably Crater Lake’s most famous landmark. The Phantom Ship – Sorry about the people standing in the pic; I was told pushing them in the water was frowned upon. The Pumice Castle is an outcropping of fragmental pumice along the wall of the caldera. 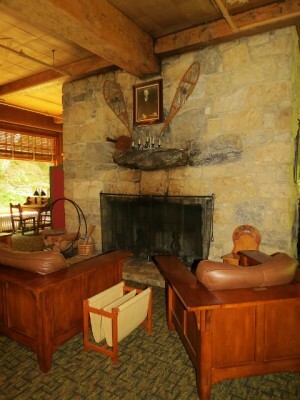 It is striking because of its bright orange color; it sharply contrasts with the gray of the rock around it. 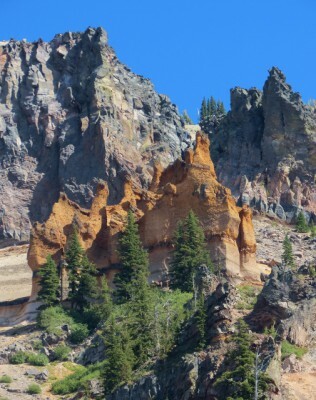 It is another example of how erosion has revealed geologic features at Crater Lake. The Pumice Castle – Jon loved this because it is orange. 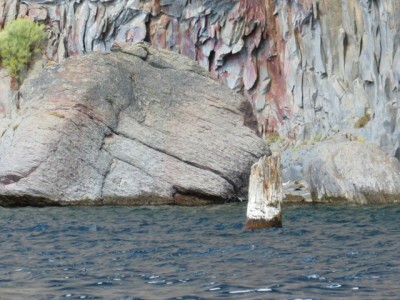 The Old Man is a Mountain Hemlock trunk that has been floating upright in the lake for more than 100 years. It is pushed to different areas of the lake by the wind and lake currents, but I don’t think they know why the Old Man bobs along in his upright position. 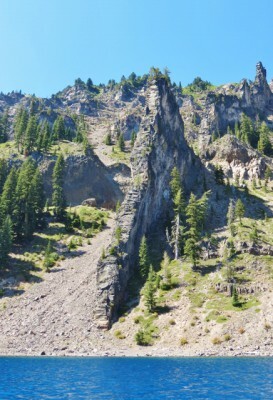 The Old Man of Crater Lake – a Mountain Hemlock that has been bobbing along upright for over 100 years. The tour also explained the water’s clarity, which I discussed in my previous post, and the flora and fauna of the lake. The Ranger told us that other than ground squirrels, wildlife was not frequently seen near the surface of the lake, because the loose scree made it difficult to travel down the edges of the caldera. Simply put, the animals aren’t that crazy. William Gladstone Steel began stocking the lake with fish as early as 1888 and the stocking continued until 1941. Two species were able to acclimate to the lake and begin reproducing naturally; Kokanee Salmon and Rainbow Trout. Both of these species are abundant in the lake today. You can fish to your heart’s content during the season, but there are no organic baits or lures allowed. And fishing in the Park’s many creeks is prohibited. The endangered Bull Trout makes its home in those waters, and they are trying to help it make a comeback. After our two hour tour on the lake, the boat finally motored back to Cleetwood Cove and we were back on dry land. We still had to make the 1.1 mile hike back up to the rim of the caldera, but it went more quickly than I expected. Of course, Jon couldn’t wait for us slowskies (me and Jon’s parents), so he powered up to the top and waited for us there. This is a view of the Phantom Ship from the Cleetwood Cove Trail – not as much detail, but no people in the photo either! 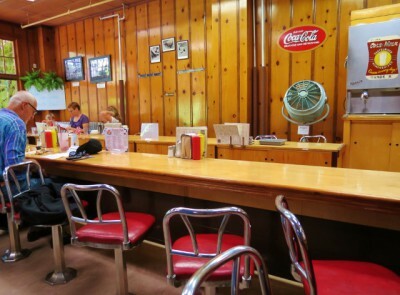 We drove over to the concession area, got a snack, and spent some time perusing the gift shop before heading towards home. 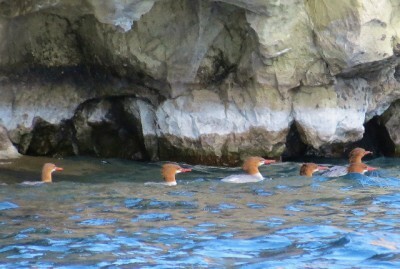 A great day – I had a fabulous time on the boat tour and would highly recommend it! Would you want to take the Crater Lake Boat Tour? Did you know what the deepest lake in the United States is? Crater Lake! It is also the ninth deepest lake in the world, and contains some of the world’s clearest waters. And we were lucky enough to visit again in August! Crater Lake National Park was the fifth National Park to be named, on May 22, 1902, by Congress and Theodore Roosevelt. Although it was one of the earliest parks, that was thanks to the perseverance of William Gladstone Steel, who had been lobbying Congress to create the park since 1870! Steel first learned about Crater Lake in1870 and was immediately enthralled, but it took another 15 years before he had the chance to visit. He participated in many of the scientific experiments in the 1880s that established Crater Lake as the deepest in the U.S., and documented its exceptional clarity. 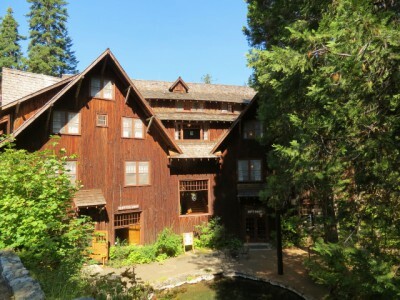 Steel also was integral to the building on Crater Lake Lodge, which was completed in 1915, and the Rim Drive, which is a 33 mile drive around the entire rim of the lake, which was completed in 1918. Of course, the Native Americans in the area, belonging to the Klamath tribe, have known about Crater Lake for thousands of years. In fact, their oral tradition includes stories of the eruption that blew the top off of Mount Mazama 7,700 years ago, and created Crater Lake in the caldera that was formed. According to their tradition, two Chiefs, Llao, of the Below World, and Skell, of the Above World fought each other in a battle. Llao had visited the top of Mount Mazama, and on one visit, had seen Loha, the daughter of a Klamath Chief. When she rejected him because he was ugly (aren’t these stories always about unrequited love?) Llao rained fire onto the Klamath people. They appealed to Skell for help, and that’s when the trouble really got going. After a fierce battle, Skell defeated Llao and drove him back into the underworld, and covered the hole with the top of Mount Mazama, and then to ensure he wouldn’t get out again, covered it with a dark pit of water that still exists today. Gold prospectors “discovered” the lake while out searching for gold in 1853. However, they didn’t find any gold there, so the find wasn’t all that momentous. But eventually, Crater Lake attracted enough attention that the media wrote about it, and William Gladstone Steel began his quest to get Crater Lake designated as a National Park. I have written about Crater Lake before; it is the one place (at least so far) where I have felt so overcome by a sense of peace and tranquility even when surrounded by people. It just has that effect on me. There are many peaceful places, but peace within a crowd of people is scarce. 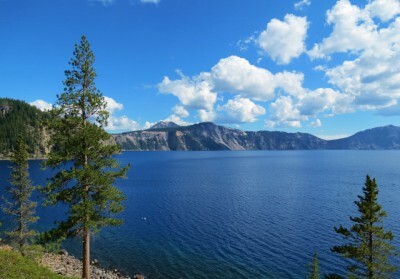 Surprisingly, Crater Lake isn’t a hugely visited park; annual attendance in 2012 was 447,251. I have such a hard time understanding why more people don’t want to go! Part of this low attendance is because of the fact that snow covers the area for a full eight months of the year; the park is open all year but has limited accessibility outside of the June to early October summer window. Only about 100,000 people visit outside of the summer season. You have to be pretty determined to visit in the winter; the record year for snow came in 1950, with 903 inches of snow! And the tranquility I felt when gazing at the lake? I think that’s in part due to the sapphire blue color of the lake itself. The stunning blue is caused by its depth, and the fact that the water is so clear. A secchi disk (an 8″ black and white disk that is dropped to measure clarity) was still visible at 139 feet below the surface of the lake! The water is so clear because there are no rivers or streams pouring sediment into the lake. The only water coming in is rain and snow melt. And the porous volcanic soil allows the snow melt to run down into the lake without taking much sediment with it. I was so excited that we got to visit again, and this time, we were going to take the boat tour around the lake! Have you been to Crater Lake? Did you do the boat tour? 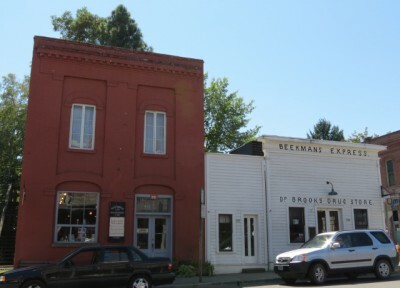 You want to know one of the best things about Oregon Wine Country? The signage! Well, that, and the wineries! Oregon has some of the easiest wine country to navigate, thanks to hundreds of little blue roadsigns pointing you to the wineries. 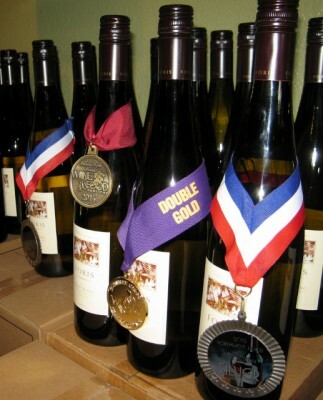 Even if you didn’t have a map, or a GPS, or a guidebook, you could find some wine! On our way back from a satisfying day trip to Oregon Caves National Monument, we saw a few of those winery signs and decided to make an impromptu stop at Foris Vineyards. Of the four of us, Jon was the only one who had heard of Foris – but his dad doesn’t really pay attention to wineries or wine so really, only three of us count on this score. But Jon had heard good things, so drove a few miles down the country road, following the signs and ended up at a little tasting room in the front section of a wine production facility. 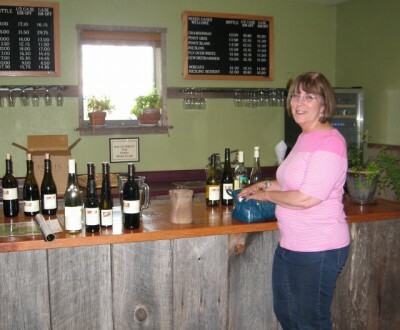 Foris Vineyards is family owned and operated by the Gerber family, and has been since 1971. 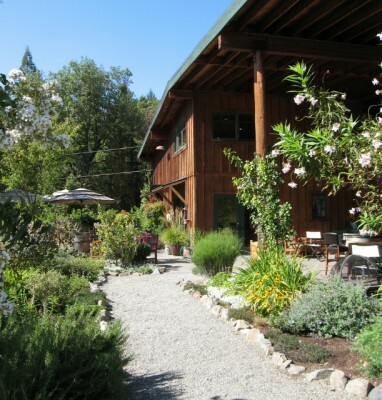 That’s when Ted Gerber and his wife purchased the property; they planted the first vines in 1974. 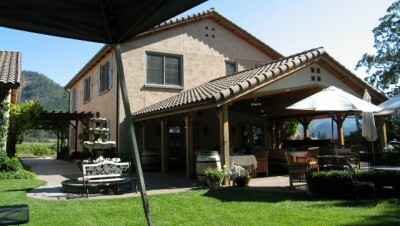 For awhile they sold their grapes to other wineries, but in 1986 they began using their grapes to make their own wine. Currently about 80% of the grapes they use are estate grown. When we went into the tasting room, we were warmly greeted by our server. When we told her that we had just been to Oregon Caves, she asked which ranger had given our tour. 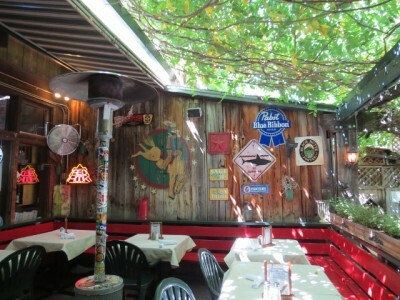 When we told her, her eyes lit up and she explained that he frequented the tasting room on his days off. Just another reason why National Park Rangers are so awesome! We were guided through the lineup, and I found myself really enjoying the reds. We were able to do a side by side tasting of their two Pinot Noirs; one their flagship Pinot and the other the single vineyard Pinot from the Maple Ranch vineyard. Both were delicious! Their Cabernet Sauvigon and Cab Franc were also very good. My mother in law really enjoyed the Fly Over Red blend and their sweet Moscato. The Fly Over wines show that this wine-making family has a great sense of humor; these wines are named for the fact that because the Illinois Valley of Oregon is one of the most remote wine growing regions in the nation, many members of the national wine press will never come out to witness these wines being made. 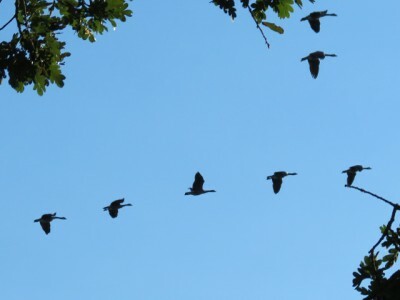 So the folks at Foris simply wave at the planes overhead, because you never know who is “flying over”. Jon came in and out of the tasting room to sample my wine at his leisure, and then settled with his father on the Adirondack chairs outside. Linda and I took our time enjoying the wines and chatting with the server. Soon enough, we were on our way back to our home away from home by the river, to swim in the pool, eat dinner and wile away a relaxing evening, with a newly opened bottle of wine. I was finally going to tour the Oregon Caves! But first a few safety precautions. Not for us… For the bats! You see, bats that live east of the Rocky Mountains are being decimated by White Nose Syndrome. Infection with the fungus causes bats to rouse too frequently from hibernation and they starve to death through excessive activity. The symptoms include loss of body fat, unusual winter behavior (including flying), damage and scarring of the wing membranes, and death. Sadly, affected areas have experienced declines in the bat population of over 90%. Luckily, White Nose Syndrome has not yet made its way to the bats at The Oregon Caves, so the tour guides take precautions. You cannot bring any shoes or clothing that have entered a cave where the fungus is known to exist. We checked out and got our tokens, indicating we had passed the safety check. Then it was time! 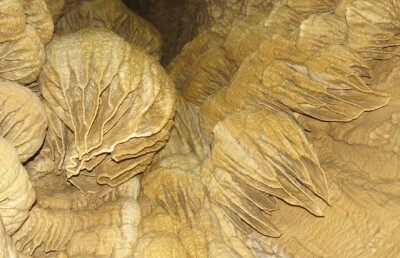 The tour lasts about 90 minutes and travels about 1 mile through the cave. We entered the cave at the entrance where Elijah Davidson first entered in 1874. It was surprising how quickly the light goes away. The cave is equipped with electric lights, but our Ranger turned them off to let us experience the total darkness. A stream runs through the cave; so you could hear the sound of water. Once the lights were back on, we were guided along a series of narrow passageways and metal staircases. 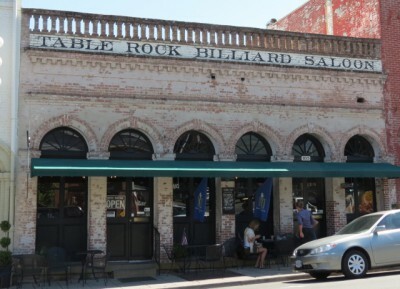 The Ranger showed us the dingy brown color of the marble along the route, discolored over a hundred years by the oils in so many hands; high up on the walls the marble was bright white. 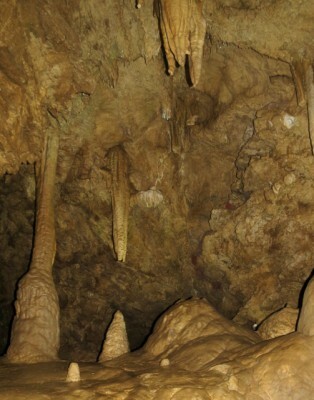 We saw the different formations, stalactites and stalagmites, soda straws, popcorn, bacon, moonmilk, columns, draperies (also called curtains) and flowstone. The draperies in one room reminded me of those meringue cookies that you can buy at the store. 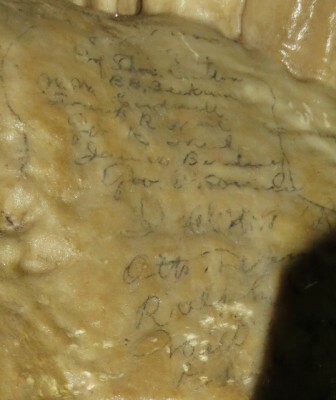 We also saw where early tourists signed their names on the marble; the writing is clearly visible but is now encased in a clear stone layer, as new marble is forming over top. Although geological changes occur extremely slowly, this is one time where change is clearly evident. 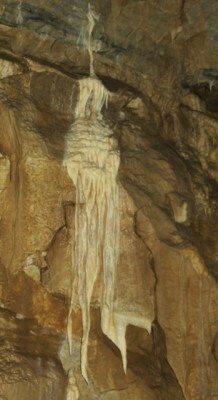 We also saw where stalactites and stalagmites were broken off and carted away by people eager for a souvenir. Our Ranger also did a great job of showing us how the tour has changed over time. We were walking on smooth surfaces lit by electric lights, with metal catwalks and metal staircases. But in the early days of Oregon Cave tours, tourists did not have the luxury of today’s infrastructure. They did their tours with lanterns and wooden ladders, which became very slippery from water dripping in caves. Our Ranger pointed out where the original tour route was, and sections where visitors had to hold onto handholds in the wall, and creep along narrow ledges. I’m not nearly that adventurous. We also got to hear stories about life in the caves. Fossil bones from several species have been found, including a jaguar that is estimated to be between 20,000 and 40,000 years old and a grizzly bear that is over 50,000 years old. Other fossils include the rare mountain beaver and a blue grouse. The tour took us by the grizzly bear bones, which are encased in a viewing box at the end of the tour – still in the same place where they were found. The whole tour was fascinating, seeing all the different rooms and passages, and it didn’t feel like 90 minutes had gone by when we finished the tour. The cave is pretty cold though, staying a relatively constant 44 degrees, so it was nice to get back out into the 80 degree sunshine! 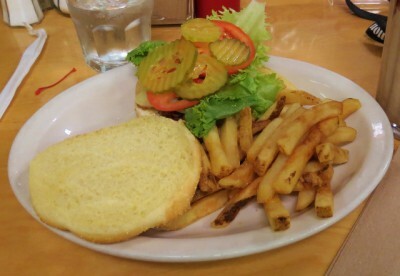 And after the tour we went to get some lunch at the Oregon Caves Chateau!